The main character of the story Amu Hinamori, is a student at Seiyo Elementary. At first glance, her classmates refer to her as "cool and spicy" and rumors speculate about her personal life. However, her real personality is that of a very shy girl who has trouble showing her true personality. One night, Amu wishes for the courage to show her "would-be" self, and the next morning finds three brightly colored eggs—hot pink, blue, and green—in her bed. At first, she is alarmed, but realizes she must have really wished to change. These eggs hatch into three Guardian Characters: Ran, Miki, and Su. The Guardian Characters aid Amu in discovering who she truly is and help fulfill Amu's dreams. the guardian characters represent her dream. Amu's life becomes much more complex as she struggles to deal with her "would-be selves" and the Seiyo Elementary's Guardians, who each have a Guardian Character of their own. Later on,they recruit Amu as the "Joker" to search for X Eggs and X Characters, the corrupted forms of people's dreams, so the Guardians can purify their dreams. Meanwhile, the Easter Company is extracting people's eggs in search of a special egg called the Embryo. The Embryo is believed to grant any wish to the one who possesses it. However, the process creates X Eggs and X Characters. Later on in the series, a fourth (yellow) egg named Dia is born. Unlike Amu's other Guardian Characters, she is only seen a few times in the series. Due to Amu's mixed feelings before Dia was born, her egg has an X on it and is "stolen" by Utau Hoshina, who uses Dia for her concerts planned by Easter. Later on, Dia is purified and becomes a regular Guardian Character. She would then would appear in times of heavy crisis. Remember what i said about just rping here instead so its more of a private rp? So we shall be starting off at night...And Ikuto...Some how finds his way into teh bed..
Amu I curled up on the edge of my bed facing the wall.Vivid dreams rushed through my head.It was late at night and I saw Ikuto coming after me.I awoke moments later and felt something.I turned my head slowly and looked down at Ikuto "I..swear...I told you to sleep on the floor"
Ikuto I'm not moving. He wraps his arms around her. Amu I struggled at first but I knew he was stronger and there was no way he was letting me go.I sighed silently "Is there a reason you wont sleep on the floor"
Amu "I want a real reason..DONT JUST MAKE IT UP!" 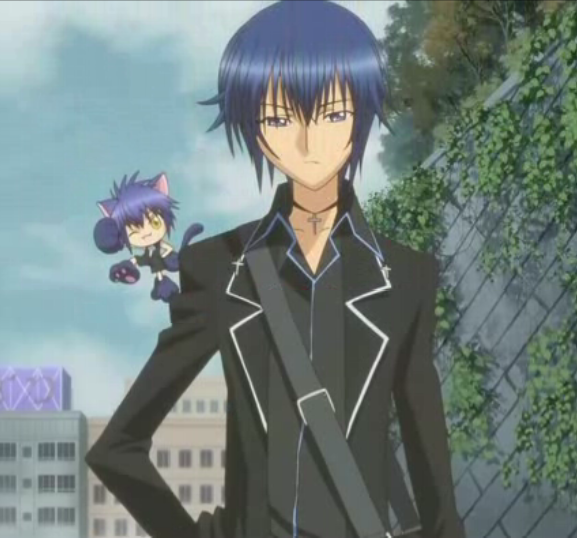 Ikuto I'm not just a cat. Amu "No n o...An Alley cat"
Ikuto looks at the bag.